One of the most important keys to a Patrol Canine Team training success is a good decoy. Without a good properly trained decoy, your canines abilities in criminal apprehension will not reach their full potential. Our 3 day seminar will train you in the proper techniques, and you will learn the art of decoying and the proper way to use those techniques to assist the canine teams to be more proficient. 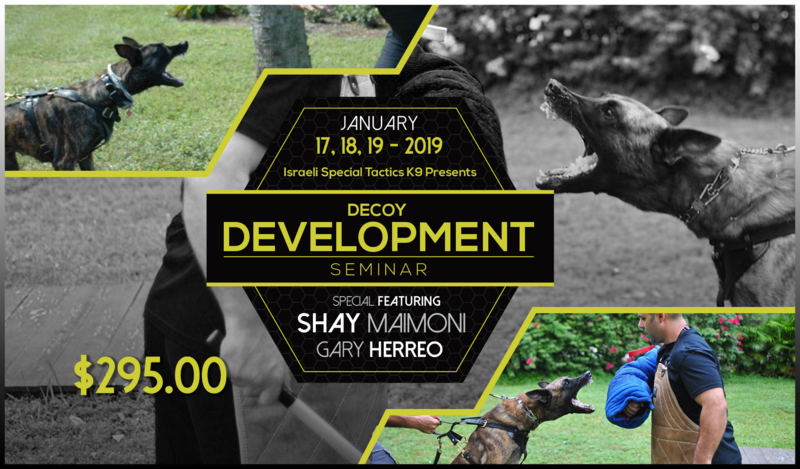 Shay Maimoni is an Israeli Defense Forces K9 Special Trainer with over 20 years of K9 training experience. He started his K9 training career in the Israeli Defense Forces Anti-Terrorism K9 Unit. The Israeli Defense Forces, which have been in constant combat for the past 60 years, train to the highest level possible with an emphasis on scenario based training for fully trained and well rounded dogs. Shay has a passion for decoying and the many ways a good decoy can make your dog better.